Provide comfort for the family of Alice Moose with a meaningful gesture of sympathy. Alice Patterson Moose, 92 passed away at Tucker Hospice House on March 15, 2019. A graveside service will be 2:00 pm Sunday at Oakwood Cemetery with Rev. Ray Sipe officiating. The family will receive friends Sunday from 1:00-1:45pm at Wilkinson Funeral Home. On June 11, 1926, Alice was born in Concord to Robert and Ruth McEachern Patterson. She had a career as a purchasing agent at Cabarrus Memorial Hospital that spanned over 32 years. She was a former member of St. James Lutheran for many years before becoming a very active member of Saint Martin Lutheran Church. In addition to her parents she was preceded in death by her daughter, Alice Lynn Moose; sisters, Edith Bond, Virginia Fischer; brothers Robert ”Bob”, William “Bill”, and J.C. “Pat” Patterson; and brothers-in-law, Harry F. Fischer and David Bonds. Ms. Moose is survived by her son, L.C. Hank Moose of Alexandria, VA, and nieces and nephews. Memorials may be made to St. Martin Lutheran Church, 5469 HWY 200, Concord NC 28025 or Hospice & Palliative Care of Cabarrus County, 5003 Hospice Lane, Kannapolis, NC 28081. 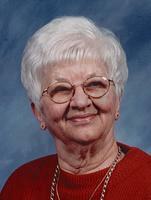 To send flowers in memory of Alice P. Moose, please visit our Heartfelt Sympathies Store. Provide comfort for the family of Alice P. Moose by sending flowers. I remember her visits to DC. She was so joyful and down to earth. It was a pleasure to go over to Pop's and get a real hug from her. What a lady.